As more companies become interested, and invest, in flying taxi’s, companies like Airbus and Uber are keen to be at the forefront of the revolution. 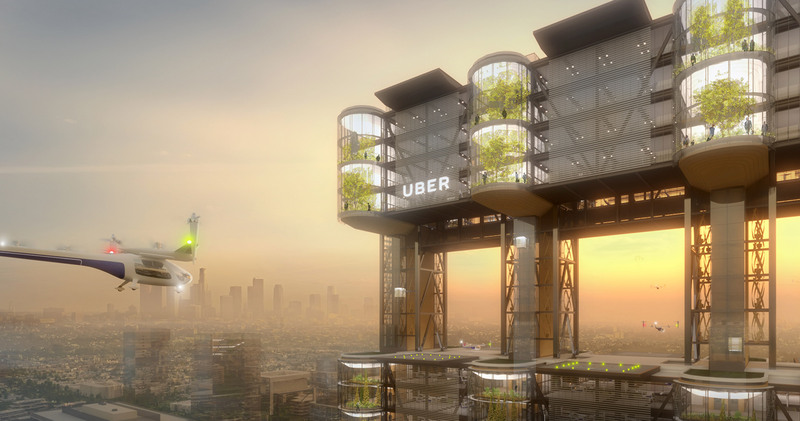 Stout cylindrical towers that cars can fly inside and stacked landing pods are among the proposals that architects and engineers have imagined for Uber’s fleet of sky taxis, sourced from companies including Airbus, EHang and Volocopter, whose taxi’s have been buzzing round the skies of Dubai, as plans for UberAir push ahead for 2020 launch. Uber unveiled the six prototypes for what they’re calling the “UberAIR Skyports” at its second annual Elevate summit in Los Angeles recently. 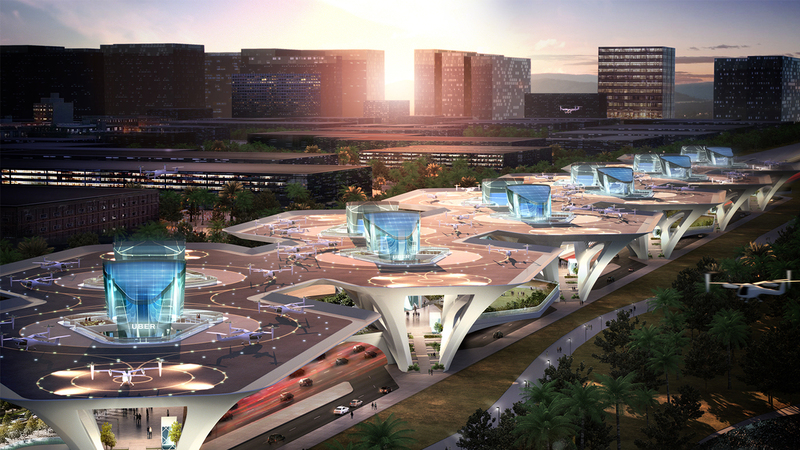 The designs by Gannett Fleming, Pickard Chilton with Arup, Corgan, Humphreys & Partners Architects, The Beck Group and BOKA Powell respond to the Uber Elevate Skyport Challenge, which called for architecture and engineering firms to develop the take-off and landing ports for UberAIR – an on-demand, app-based flying taxi service. Proposals include architecture firm Humphreys & Partners’ design for a round complex based on a beehive. Although conceptual, Uber chose the six designs for their “high degree of realism and technical feasibility” in imagining Skyports for its fleet of electric vertical take-off and landing vehicles (eVTOL), which it plans to begin testing in 2020. “While uberAIR might feel like a far away dream, it’s closer than you think and urban infrastructure has to start to evolve now to keep up,” said John Badalamenti, Uber’s head of design for advanced programmes and aviation, in a statement. 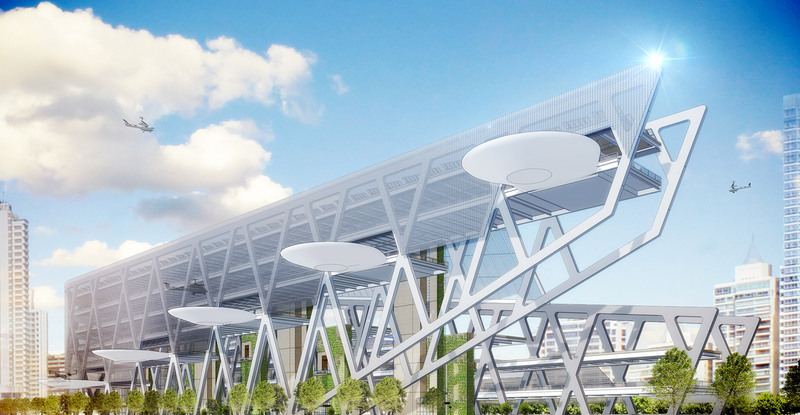 “We’re excited to have collaborated with leading firms to imagine how physical Skyports would work at scale and how we can best design spaces that are quiet, environmentally conscious and create natural pockets of activity for the transportation of the future,” Badalamenti continued. As part of the brief, the ports are intended for popular city locations, such as concert halls and stadiums, where crowds are likely to gather and hail a flying cab. Each are capable of handling more that 4,000 passengers per hour within a three acre footprint, while other stipulations include providing charging stations for the eVTOLs and meeting noise and environmental requirements. 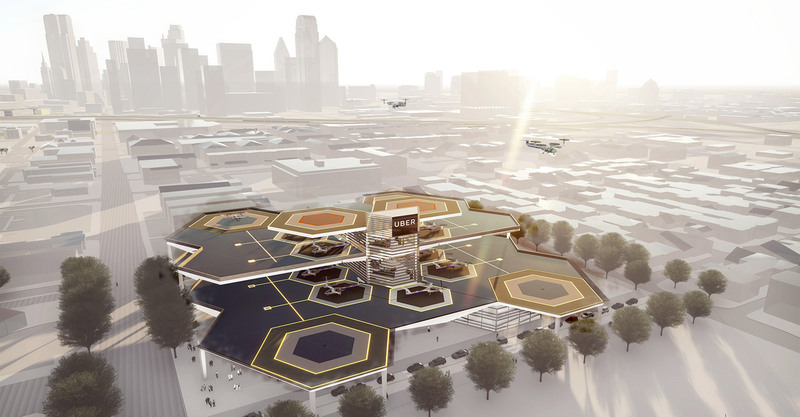 American engineering firm Gannett Fleming’s proposal responded with an elevated platform featuring a series of circular landing pads decorated with the brand’s logo that together could accommodate 52 eVTOLS per hour. In order to quicken the service, once the taxis have landed they would be turned 180 degrees by a robot to make them ready for take-off. The design, named The Paw, would also source energy for charging the cars sustainably. The structure would be built with “transparent concrete” so as not to block light and fitted with photovoltaics. Meanwhile, the Sky Tower solution developed by Connecticut architecture studio Pickard Chilton and engineering firm Arup imagines building the skyport by stacking up a module that hosts for 180 landings and take-offs per hour. The modular system would allow for a variety of arrangements depending on the location. “While our design for the Skyport is conceptual, it is not science fiction,” said Pickard Chilton principal Jon Pickard in a statement. Comprising irregularly shaped pods that can be paired to form a landing and take-off pad or stacked on top of one another, Connect by US architecture and design firm Corgan also employs a modular design. The modules would host three layers with flight decks, a station in the middle and a public plaza at the base that Corgan intends to be integrated with existing city infrastructure. “While the main task of the Uber Skyport is to develop a paradigm for public access to eVTOLs, we extended it to explore how Skyports could reconnect the community, how they can become an important amenity to the neighbourhood, and how they could bridge some of the divides we see in our cities,” said John Trupiano, principal at Corgan’s Aviation Studio, in a statement. 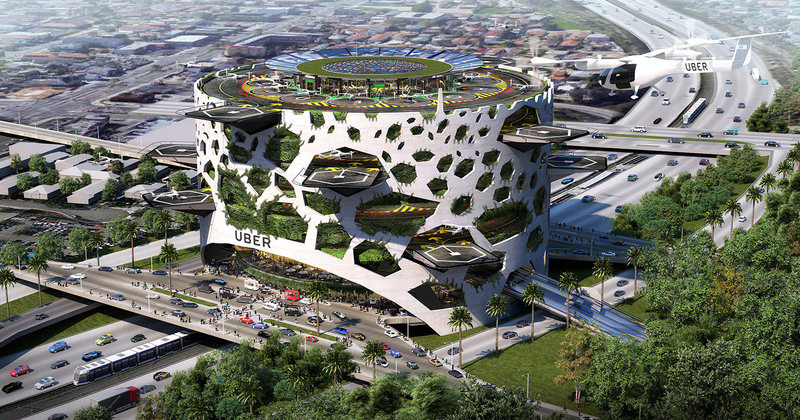 Among the other design proposals is the Uber Hover by architecture firm Humphreys & Partners. Modelled on a beehive, the white rounded structure is punctured with openings for cars to fly into. Architecture and construction company The Beck Group also took cues from bees the hexagonal landing ports in The Hive. While US architecture firm BOCKPowell referenced the “dynamics of flight” to stagger landing stations up the criss-crossed, diagonal frame in its Skyport Prototype. Revealed last year, UberAIR forms part of the ride-sharing apps’ Elevate initiative, which would see cars replaced with electric aircrafts that are capable of taking off and landing vertically as a quicker and more environmentally friendly way to travel. The service will function much like the company’s current app, through which users can order a taxi on-demand with payments automatically deducted from stored card details. Uber, which plans to develop the infrastructure for the takeoff and landing hubs with real estate investment company Sandstone Properties, is expecting to begin tests for the service in Los Angeles in 2020, and subsequently Dallas, Fort Worth and Frisco. Only six! Must have either ran out of papers or the herb at the meeting. Corgan’s definitely has my vote. Modular is a must for scalability.